Are You Looking For A Marketing Campaign That Is Technologically Advanced? Do your marketing objectives, or your marketing campaign, need a fresh new start or just an update to help you be more technologically with the times? If this applies to your small business, there are a few different options out there for you to appeal to a variety of consumers on different marketing avenues. One of the first techniques you can employ for your marketing campaign is mobile optimization of your website. When you use mobile optimization, you essentially have a website that is user-friendly to any type of mobile device, such as a smart phone or tablet. Mobile optimization can help you reach out to a variety of consumers that you may never have had the opportunity to come across before as many people these days mainly use their smart phone or mobile device to access the internet. Another option to help you reach out to a wide range of consumers and get your product out there is to use a social media marketing campaign. When you use social media marketing, such as Facebook, Twitter or Google+, it allows you to create a following of customers and to connect with them on a more personal level as well as on a daily basis. There are over a billion active users that are currently on Facebook, so the number of people that you can reach out to is astronomical. If either of these marketing strategies appeals to you with regards to your marketing campaign you should contact Direct Business Marketing for more information on how to get started. DBM can go over your marketing objectives and your existing marketing campaign with you and help you determine which strategies will help meet the needs and goals of your business. They’ll apply their proven successful marketing truths to any marketing campaign that they undertake with you to ensure that your business’s marketing needs are being met. https://directbusinessmarketing.com/wp-content/uploads/2016/02/DBM-logo_horizontal_white_100x275.png 0 0 Webmaster https://directbusinessmarketing.com/wp-content/uploads/2016/02/DBM-logo_horizontal_white_100x275.png Webmaster2013-06-14 23:04:272013-06-14 23:04:27Are You Looking For A Marketing Campaign That Is Technologically Advanced? Hello everyone Granison Shines here with Direct Business Marketing talking with you today about the importance of event marketing and some tools to make sure it is a success. At Direct Business Marketing we have been utilizing event marketing for years and in the time have found what works and what doesn’t when preparing for your upcoming event. If you are getting ready to host an event or just looking to improve on the last one you had please reach out to me with any questions or comments. First of all it is important to be aware of all the different types of events you can host to help educate your customer. Whether it is a town hall meeting, live webinar, or a workshop we have put together four of the key components to a successful event. People tend to buy from a credible, educated source and by hosting an event you are able to grow your credibility and also your customer base. An event will also require your customer base to act in some fashion before a specific date in order to be involved. A call to action before your event helps focus your customer base on the benefits your product or service will provide to them. Hosting an event will also imply scarcity to your customer and this can also serve as a call to action. A successful event will only be available to a certain number of people with an allotted amount of time making your message that much more powerful. The final component of a successful event deals with the fact your customer must make a commitment in order to attend the event. By developing this psychological factor of marketing you are gaining their attention and curiosity long before the event. I hope this has provided some great information to get you started planning your next successful event. 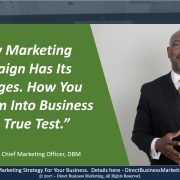 Make sure to download our marketing assessment tool off of the Direct Business Marketing website to find other great tools for your marketing needs. Thanks again for your time and make sure to stop back soon for more great marketing advice. Are you starting a new business and are wondering just how in the world you’re going to pull off a successful marketing campaign? If you’re in a situation such as this, Direct Business Marketing (DBM) is here to help you. 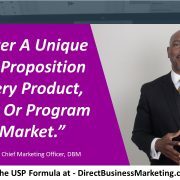 DBM is a premiere marketing firm that specializes in all different types of marketing strategies all with one goal in mind: a successful marketing campaign for their client. DBM works together with the customer to determine which marketing avenues will ensure the best results for that business’s marketing campaign. 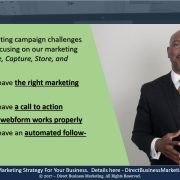 Direct Business Marketing has developed a marketing evaluation tool, which can be found on their website, to help you determine which types of marketing avenues you should pursue for your business. Some of their services include website creation, eCommerce, social media marketing and search engine optimization, just to name a few. 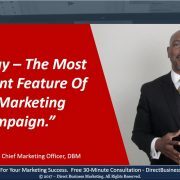 If you contact DBM, they’ll go over their marketing evaluation with you and provide you with suggestions and ideas on how to run a marketing campaign that will generate the leads and sales that you are hoping for with your business. There are many different techniques out there today that businesses use to promote brand awareness and Direct Business Marketing knows all of them. 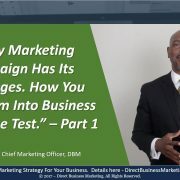 If you have thought at all about how important your marketing campaign is to the success of your business, you should check out the marketing evaluation on DBM’s website and give them a call today. They have the proven success of many marketing campaigns behind them to guide you through the steps of launching your own successful marketing campaign. Starting a new business and getting the word out about it can be a daunting and scary task, but it’s important to know that you’re not alone in this endeavor. Contact Direct Business Marketing today; the success of your business depends on it.